The splint can be folded as shown at right and applied to support the upper arm. To splint the wrist or forearm, the splint should be applied around the elbow. A T-Bend dramatically increases the strength of the splint. Two splints can be used, one on each side of the leg for knee or leg injuries. Wrap the splint loosely around the neck and gently squeeze to produce supporting posts. 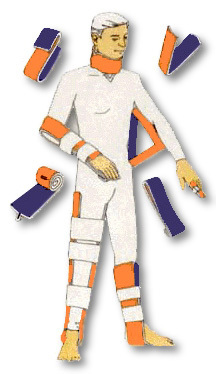 The splint can be folded to form a triangle"Airplane Splint" for dislocated shoulders. The splint can be doubled for increased strength - rigid enough for an IV board or a Colles Fracture. The ankle is splinted with a single splint - folded under the foot and applied to each side. As with any potentialy useful device, you must practice in order to become proficient in its use. Don't wait until an injury occurs to learn the splint folds. When you get your SAM®Splint take it out of the wrapper and practice with it. The splint is re-usable and can be folded and unfolded without structural damage. Better yet - Order two! Practice on one and save the other for emergencies. Remember, two come in handy for leg injuries. We hope you never have to use SAM®Splint, but if the situation arises, YOU'LL BE READY!